Oooooh, I'm in trouble again! This bug that is hanging around me is definitely making me a bit dopey (well, worse than usual) and I completely forgot to schedule this post. 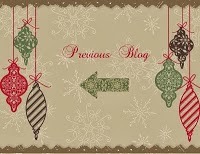 Holly Jolly is having a Blog Hop for the whole of December and we'd all love if you'd come along and join us. There are loads of prizes to be won. Check out the blog to find out what's on offer. This is so beautiful Anne. Nasty Mr Bug, I hope he leaves you soon. Such a fun card. I really like the bell theme. 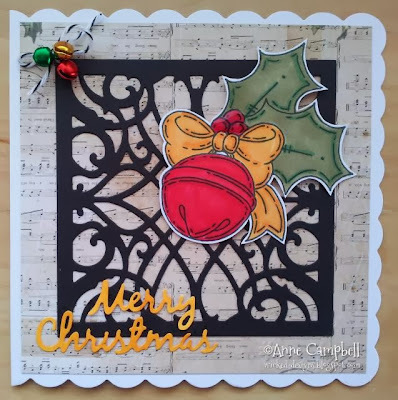 This is a fabulous card Anne, I love the lace frame. Love your fabulous Christmas card. Beautiful card, love the huge bell and the little ones in the corner! Great hop! Hope you're better!! Your card is terrific - puts me in the Christmas spirit! Wonderful card - love those little jingle bells! What a lovely creation. Sorry to hear you are sick with a nasty bug (so am I and it's just hanging on and on).